How do I delete a workspace? In order to delete a workspace, you'll first need to be the owner of the workspace. 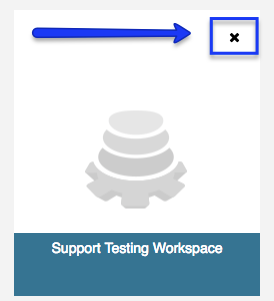 Once you've confirmed you're the owner, visit the Home screen, locate the workspace, and click the 'X' in the top right corner of the workspace tile. You will be asked to confirm the deletion by typing out the full name of the workspace. 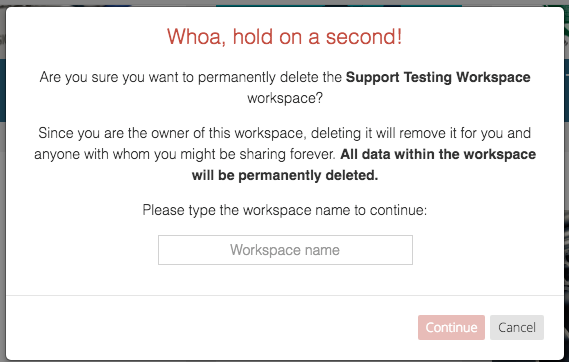 You will be asked to confirm the deletion by typing out the full name of the workspace. Caution: Deleting a workspace deletes ALL data associated with that workspace, and the deleted data CANNOT be recovered. If you are a workspace owner and wish to remove yourself from a workspace without losing the data, you should either first export the data and/or transfer ownership to someone else. What are Parent and Child Records?